Welcome to the December 3, 2013 edition of carnival of the horses. I hope that all my readers had a wonderful Thanksgiving or Hanukkah. I’m sorry that I’m a little late in posting this month’s Carnival. The holiday weekend left me with some catching up to do. However, it’s worth the wait — some wonderful posts featured this month! Anna Blake presents Thanks for the Eggs posted at AnnaBlakeBlog. L. Williams presents Viva Carlos Book Review: Form Over Fences posted at Viva Carlos. Suzanne presents Kindness of Others posted at Confessions of an AA Event Rider. L. Williams presents Lessons from No Stirrups Past posted at Viva Carlos. Jane presents Alice Takes a Tour Through . . . posted at The Literary Horse. SheMovedtoTexas presents Model Horse Showing I – My Hobby Confession posted at She Moved to Texas. SheMovedtoTexas presents Being a Good Blogging Citizen posted at She Moved to Texas. SheMovedtoTexas presents Don’t Wait | Horse Blog in the Lone Star State posted at She Moved to Texas. Susan Friedland-Smith presents 1982 Letter to Santa | Saddle Seeks Horse posted at Saddle Seeks Horse. 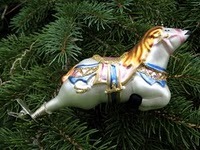 Tiny Tim presents Counting my Blessings posted at hooveswho. Fran Jurga presents Horseshoes in Congress: Whitfield-Cohen Letter Clarifies “Weighted Shoe” Under Proposed PAST Act; House Hearing on Soring Legislation Wednesday posted at Fran Jurga’s Hoof Blog. Lisa L. presents When Stirrup Irons are more than Stirrup Irons posted at Staying Centered. That concludes this edition. Submit your blog article to the next edition of carnival of the horses using our carnival submission form. Past posts and future hosts can be found on our blog carnival index page. carnival of the horses, blog carnival. Does not having a horse leave a hole in you, too?